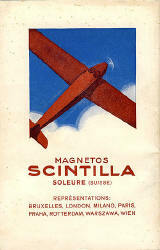 Advertisement for "Scintilla" batteries, 1937 (flip side of brochure for "IV. 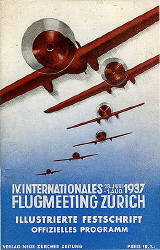 Internationales Flugmeeting Zürich, 23. Juli-1. Aug. 1937. Brochure for "IV. Internationales Flugmeeting Zürich, 23. Juli-1. Aug. 1937. Time-table for the "Scandinavian Air Express - Oslo - London - Paris - M.M.," 1932. Signed "Damsleth." Map of the A.B.A./K.L.M. London-Amsterdam-Malmö Scandanavian Air Express Route Map, 1935. Signed "van Steeden - Hollagen." Time-table for Deruluft, Berlin - Moscow - Leningrad, 1/5-3/10 1936.